Shopping for Star Trek Construction Toys? The pride of the Klingon fleet! Display the strength of the Klingon Empire when you build the Klingon D7 Battlecruiser collector construction set by Mega Bloks Star Trek! The pride of the Klingon fleet, this imposing warship is swift to battle, especially when led by the cunning Commander Kor. 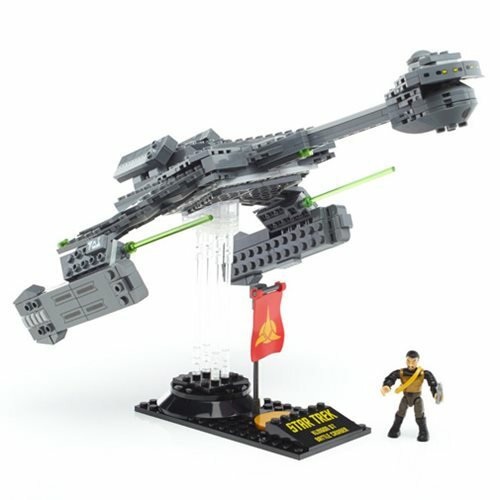 Inspired by the iconic vessel from Star Trek: The Original Series, this buildable ship features deluxe printed detail and twin disruptor cannons firing green disruptor beams. The ship comes with a swiveling display stand, printed nameplate, and a premium fabric standard bearing the Klingon insignia. Meanwhile, the highly detailed, super-poseable Kor micro action figure comes with removable armor and an authentic disruptor weapon accessory. Ideal for ages 12 and up.